What is it that makes you fall in love with a character (or characters) in a story? Do you like your leading men to be the strong alpha type? Should they have flaws? Should they be vulnerable? What about your leading women, should they be strong? Do you think it is okay for a female lead character to be aggressive? I try to ask myself these questions when developing a character but mostly, the characters in my stories just kind of develop themselves, for the most part. I begin with a basic outline of what character traits my particular character may need to survive the hell I'm about to put them through. From there, they just kind of grow and become more real with each subsequent re-write of the story. Well, the first day of Spring has come and gone. I may have missed it completely if not for the radio. Funny thing about Spring. Things just seem to sit dormant all winter, and then suddenly one day, bam, all things are alive and taking over. I so quickly became overwhelmed with everything having to be done at once, that my yard now appears with its usual "Sanford & Son" look. Oh well, soon Summer will be here to scorch my property to the very edge of its existence. They all blend together in a hot flashing haze. Force me to rise and see what new torture the sunrise brings. The angry forceful advance of new life, in this season we call, Spring. 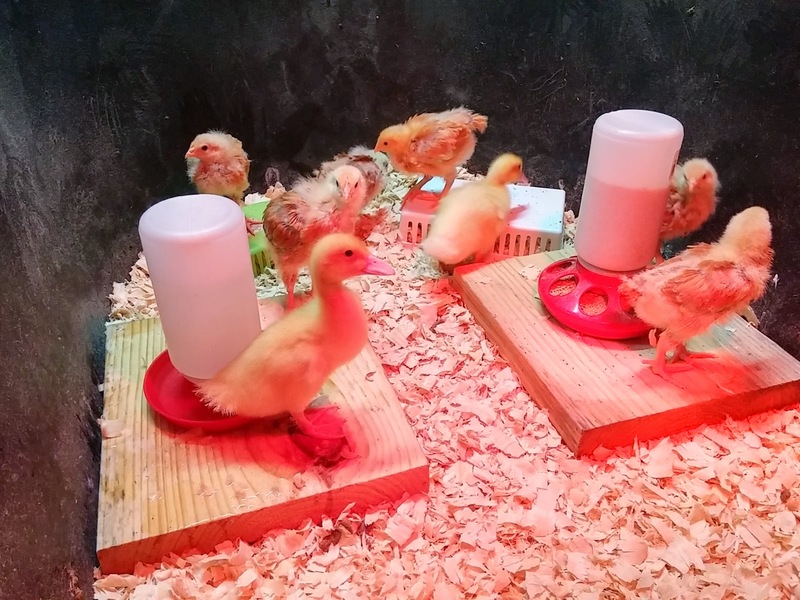 We recently purchased two ducklings from our local Tractor Supply Company store.They were oh so cute, and still are but, I must say, they grow extremely fast. We brought these ducklings home about a week after bringing home six chicks. At first, they were so small, we were afraid the chicks would bully them-that changed quickly. They are now about twice the size as the chicks although they are not yet feathered. In contrast the chicks are nearly completely feathered. Last night was their first time out in the wild (a chicken wire enclosure in the back yard) and they did not use the new duck home I'm building for them. Instead, the chicks piled in while the two ducklings huddled together near the big tub of water I've set out for them. I was afraid they would suffer from exposure as the overnight temperature dropped into the low sixties. I mean, hey, they don't even have a feather coat to wear, although that did not seem to bother them. Wow, it's been an exciting few months. Well, actually, five months. I've been working on me-rebuilding the me you know I suppose. As most of you know, I've written some, ah, ehm, adult urban fantasy and other stories under a pen name. I've since taken the two novel-length works and performed some heavy editing/rewriting in order to make them more palatable to the masses. The second story, which will now be the first, did not need much in the way of rewriting but the first, now the second, needed much work to try and remove some of the more "adult" situations. It is difficult to say the least. I mean, just how do you explain the life of a demon succubus without some adult interpretation? Anyway, that's coming along fine and I'm formulating outlines for book three and four as I write this.